Alex Ovechkin gets a hattrick and goal number 50 in a 5-1 win over the St. Louis Blues as Braden Holtby ties NHL wins record for a season. Number 48 came on a beautiful one timer pass from John Carlson that set up the Ovechkin just below the circle. Ovechkin seemed primed for more after he snapped his first goal into the net and he did not disappoint. Ovechkin goal number 49 came off of Nicklas Backstrom assist number 49. With a classic Backstrom set up pass to a beautiful snap shot that found its way in. a whole twelve minutes for Ovechkin to get both his goals in. Ovechkin now has 108 career multi goal games. And number 50 came in the third period. A three on two breakaway saw Ovechkin streaking down the left side gobbled up the puck and took another snap shot to put it in. His second hat trick of the year, and seventh 50 goal season matching only Gretzky and Bossy for that many 50 goal seasons. Backstrom was once again the gifter giving him his own 50 point mark. Braden Holtby would finally reach win number 48 in front of the only other NHL goalie to do the same, Martin Brodeur. Although Holtby has one more potential game to go, the record is now at least partially, his. With 19 stops on 20 shots, Holtby deserved a slightly easier win. Caps goal number three came from Carlson who wanted to ensure his own multi point night. Tom Wilson made a beautiful thread of a pass to give Carlson the back hand chance. The Blues did put a little pressure on the Caps when Vladimir Tarasenko placed one past Braden Holtby at the 1:15 mark in the first, clearly the Capitals were less than phased by it. By the end of the game the Caps would lead 36-20 on shots. The Caps will officially face the Philadelphia Flyers for the first round of the playoffs with the FLyers win earlier today. NEXT GAME: Tomorrow at 7pm vs the Anaheim Ducks. 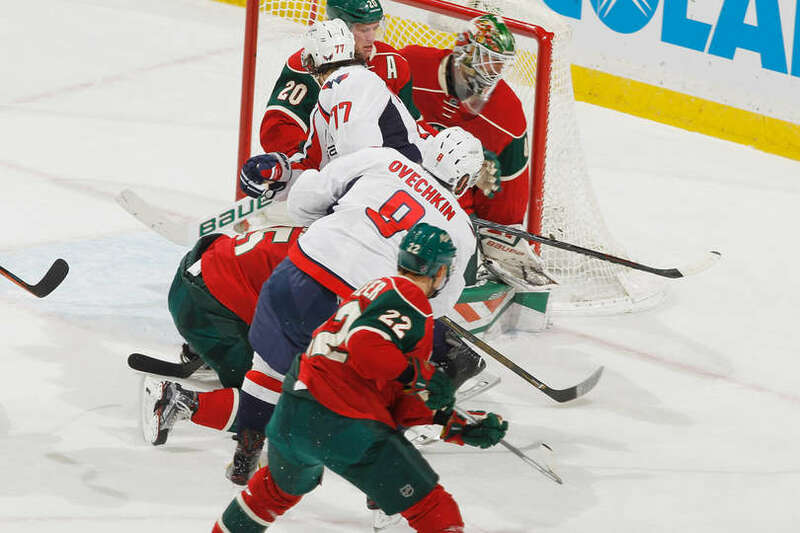 Alex Ovechkin recorded his 14th career hat trick — in the second period — and the Washington Capitals registered yet another road win, topping the Minnesota Wild 4-3 on Thursday at the Xcel Energy Center in St. Paul. After a scoreless first period, Ovechkin took over, scoring three goals in the frame to give the Caps a 3-1 lead entering the third. It was his first hattie since Dec. 13, 2013. 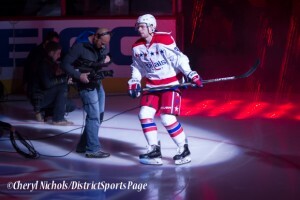 After a marvelous three game effort in Canada this week, Evgeny Kuznetsov was bestowed the NHL’s “first star” award. Racking up 3 goals and 6 assists for a total of nine points. With those numbers there may of been a small uproar had Kuznetsov not received the award. By his own admission, Washington Capitals center Nicklas Backstrom woke up from his pregame nap in a “grumpy” mood. The 27-year-old Swede was not-so-blissfully unaware of what was to come. Dwayne De Rosario scored all three goals in D.C. United’s 3-1 win over the Philadelphia Union tonight at the Maryland SoccerPlex in Boyds, Md., as United defeated its Major League Soccer rival to advance to the U.S. Open Cup quarterfinals. United will host the New England Revolution at the SoccerPlex on June 26 (7 p.m.). New England beat the New York Red Bulls, 4-2, tonight. 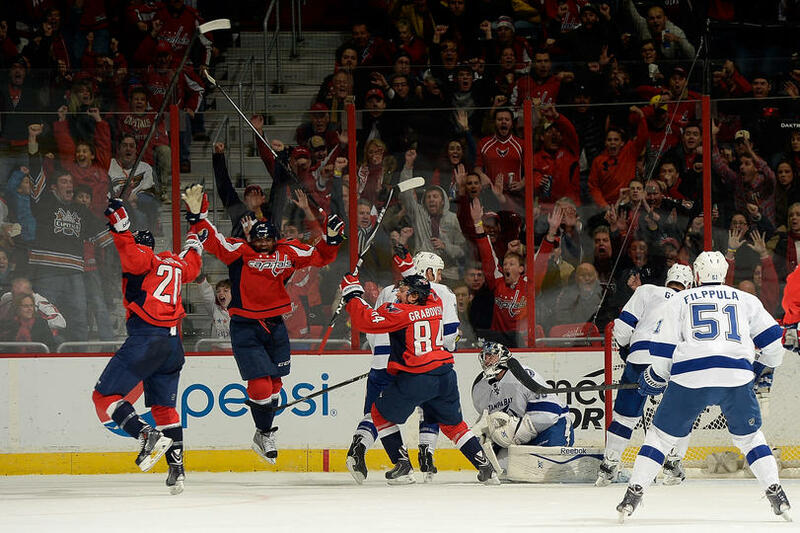 In a crucial game against a non-playoff team, the Washington Capitals staved off a late push from the Florida Panthers on Saturday night to escape Sunrise, FL with a 4-3 victory. Alexander Ovechkin recorded his second hat trick of the season as the Caps took a 4-0 lead inside the first two periods, only to allow three goals inside the final 14 minutes of regulation to the struggling Panthers. Despite a shaky third frame, Braden Holtby earned his 17th win of the season in a 23-save effort. Mike Ribeiro also scored and Nicklas Backstrom earned three assists, while Marcus Johansson added two assists and Ribeiro and Mike Green also recorded helpers. Thursday night’s loss to the New Jersey Devils was perhaps the low point of the shortened season for the Washington Capitals, as the team was in danger of completely falling out of the playoff chase with many more losses. But following the disastrous third period Thursday, the Capitals put perhaps their most complete third period of the season in a 5-1 rout of New Jersey Saturday afternoon at Verizon Center. Alex Ovechkin scored his first hat trick in over two years – and his first at home in over three – as Washington shrugged off an Ilya Kovalchuk equalizing tally late in the second to roll past the Devils with their first four-goal period of the season. With the noon start, both teams started off at a sluggish pace, with the best chance for Washington being Wojtek Wolski’s miss of a wide-open net in the first, as the forward shot a bouncing puck across the goal line with a wide open cage. But just over five minutes into the second, Ovechkin made his presence known, shaking off a hit along the wall and then moving in to the Devils zone and blasting a one-time pass from Mike Riberio past Devils netminder Johan Hedberg for the first goal of the game. After the goal, Washington, fresh off losing a 2-1 lead late in the game Thursday, played tentative in the rest of the frame, allowing a penalty shot to Steve Bernier which Holtby stopped. Although the Caps looked like they might escape with the lead into the break, Kovalchuk picked up a puck that came loose and wristed it past Braden Holtby with just :37.5 left in the second. Unlike Thursday, in the intermission, Washington regrouped and were able to record just their sixth win of the season. Just 83 seconds into the final frame, Ovechkin took a stretch pass from Matt Hendricks, and using Anton Volchenkov as a screen, wristed a shot from the top of the circle through the defenseman’s skates and past Hedberg. Things seemingly turned ominous when John Erskine was whistled for a delay-of-game penalty less than a minute after the goal. Unlike Thursday where the game came unraveled on the penalty kill, though, Washington used it to their advantage as Eric Fehr notched the team’s first shorthanded goal of the season. With Hedberg going behind the net to play the puck, Fehr charged in and left the goaltender in no-man’s land. Fehr collected the biscuit and scored a wrap-around insurance goal, giving the Caps an important boost in both confidence and on the scoreboard. For Fehr, it was his fourth goal in his 14th game of the year, a bargain for the $600,000 contract he signed in January after scoring just two with Winnipeg last season. “It was a very big goal for him, and give us much breathing room,” Ovechkin said. Armed with the lead, Ovechkin capped his first hat trick at home since Feb. 7, 2010 with a one-tier off a Riberio feed for the hat trick. For good measure, Ovechkin added an assist on Troy Brouwer’s goal with just 2:51 left in regulation, capping the 5-1 win and giving both Ovechkin and Brouwer the team lead with eight goals on the year. “I kind of figured he was going to shoot it because he’s got a hot hand tonight, but he’s a good player and sees the ice well and you’ve got to be ready,” Brouwer said. Afterwards, the Caps’ captain talked about how well his line played. While Saturday’s game wasn’t a must-win for Washington, it was pretty close, as the Capitals were in danger of falling 8 points out of the Southeast chase by night’s end. But instead of folding the tents after Thursday’s crushing setback, the Capitals came back with a complete effort, and will get another big challenge Tuesday when division rival Carolina comes to town as Washington looks to chip away at the gap between them and the playoff pack. With the effort Saturday, Hendricks said he hopes the team gets on track. “We came out and played our game,” he said. “We played a full 60 minutes. We talked earlier about being 100 percent committed to the system not only in the defensive zone, but in the neutral zone and the offensive zone. We played a full game. “It’s awesome. You can’t describe that feeling. This is what you dream of. You dream to play in the NHL, but when you get a hat trick, it’s even better. It was just a great feeling.” –Mathieu Perreault after his first career hat trick. While President Obama was addressing the Nation a few blocks away, the Verizon Center erupted in shock and joy as Mathieu Perreault got his first career hat trick and the Washington Capitals defeated the Boston Bruins, the reigning Stanley Cup Champions, 5-3.